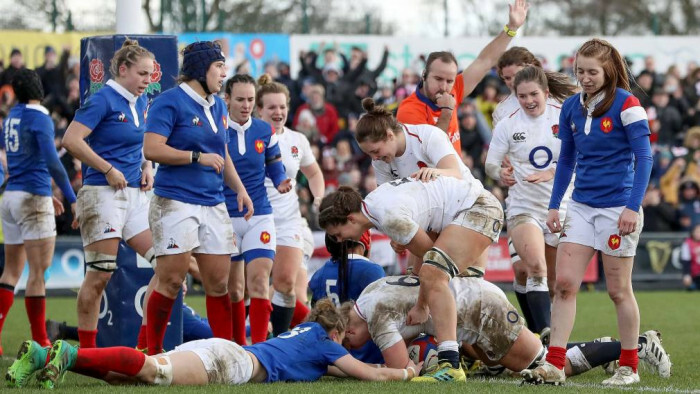 We pick our team of the week from Round 2 of the Women's 6 Nations. Four players make the team of the week for the second game in a row. They are Giado Franco, Katy Daley-Mclean, Pauline Bourdon and Jess Breach. There were some extremely tough choices this week, especially in the pack, where England in particular excelled. Although Lisa Arricastre and Sarah Bern were very strong as well as Amy Evans, we've given the nod to Caryl Thomas, who was an anchor in a fine set piece performance by Wales and Leah Lyons who was everywhere for Ireland, alongside Scotland's consistent front rower Lana Skeldon. We've gone with an all English second row, though Safi N'Diaye worked hard for France, while Anna Caplice and Giado Franco were brilliant on the flanks. Poppy Cleall for England was also prominent again. The battle to be the best no 8 in the tournament is riveting. Romane Menager is world class but was just outdone by Sarah Hunter, while Siwan Lillicrap was outstanding for Wales. Pauline Bourdon played better at 10 than she did at 9 for France - she did a half at each- but she must be included while Katy Daley-McLean continues to be a shoo-in. The rest of the backs *almost * pick themselves though the inside centre berth didn't have one singular standout. For her consistency and all round nous, we've gone with Beatrice Rigoni, while the rest are all England players after a fine clincial performance, with honourable shouts to Alison Miller and Jazz Joyce, who scored a wonder try that was eventually disallowed. * = players who also made last week's team of the week.